ThePrint's analysis of Modi's domestic travels in the last 51 days shows he clubbed over 90% of his political addresses with his official visits. New Delhi: In the last 50-odd days, Prime Minister Narendra Modi has addressed around 27 public gatherings, making full-fledged political speeches, across 21 states and Union Territories. Nothing out of place about this, except he clubbed over 90 per cent of these addresses as part of his 2019 campaign with official programmes — visiting as PM Modi but quickly metamorphosing into politician Modi — thus, venturing into ethically fuzzy territory. With Lok Sabha elections inching closer, each day is valuable for political players who are scrambling to finish first at the hustings. PM Modi seems to have adopted the modus operandi of maximising his official visits, using them for political purposes as well, and even while Parliament is in session. His visit to Kurukshetra in Haryana Tuesday, where he addressed a gathering after launching developmental projects and attending the ‘Swachch Shakti 2019’, as the budget session is still on, is just the latest example of this practice. While this was a government programme, his speech was loaded with politics, serving as nothing less than an overt campaign speech. Often, his speeches are made at the official event itself, instead of a separate rally, but are political in nature. The lines between political rallies and addresses in official events, thus, often blur. ThePrint’s detailed analysis of Modi’s domestic travels in the last 51 days — from 24 December to 12 February — shows he made around 19 trips (a visit, even if it includes more than one state or a night halt, is taken as one single trip if done at a stretch) to 21 states and UTs (with some of them being repeated). The winter session of Parliament was on from 11 December to 8 January, while the budget session that began 29 January is due to end 13 February. This effectively means on several of the days, Modi wasn’t in Delhi during the Parliament session not just for work in his capacity as PM, but also for political campaigning. The PM had set a target for holding a 100 rallies in the run-up to the Lok Sabha polls. In these nearly three months, the PM traversed the length and breadth of the country — spanning states that include Andhra Pradesh, Tamil Nadu, Uttar Pradesh, Haryana, Karnataka, Assam, Arunachal Pradesh, Tripura, Chhattisgarh, West Bengal, Jammu & Kashmir, Kerala, Odisha, Maharashtra, Manipur, Punjab, Andaman & Nicobar islands, Himachal Pradesh, Daman & Diu, Jharkhand as well as Gujarat. In the PM’s tour programmes, ‘official’ and ‘non-official’ ones are usually clearly chalked out and even a cursory glance would indicate the extent to which the two are made to overlap. The official functions largely consist of inauguration or launch of developmental projects or commemorations. In these visits — most day-long and around three of them involving a night halt — the PM addressed some 27 political rallies/gatherings/events, with 25-odd among them being combined with an official programme. In addition, he addressed a youth conclave in Surat in his home state Gujarat on 30 January, combining that with various official functions as well. Mostly, each official programme is given a shorter slot of around 15-20 minutes while his public gatherings are scheduled for about 45 minutes, but end up stretching to a longer duration. In most of his recent trips — both to BJP and non-BJP ruled states — Modi has donned two hats. 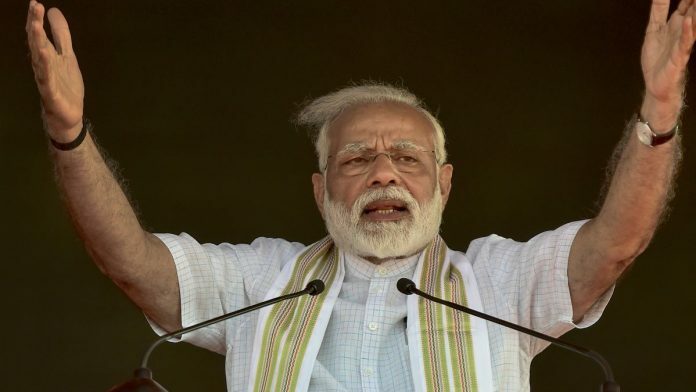 He starts off as the PM, attending programmes in that capacity, and then turns into the combative politician, addressing rallies in which he targets his rivals and furthers his party’s agenda. On 10 February, the PM made a three-state tour of southern India, visiting Andhra Pradesh, Tamil Nadu and Karnataka. In Guntur in Andhra Pradesh, the prime minister dedicated to the nation the 1.33 million metric ton capacity Visakhapatnam Strategic Petroleum Reserve facility, besides attending other inaugurations. Soon enough, however, he addressed a rally where he launched a scathing attack on Chief Minister and ally-turned-foe Chandrababu Naidu. In Tirupur in Tamil Nadu, his schedule had been set for a 10-minute programme to lay the foundation stone for ESI medical college hospital, followed by a 45-minute public meeting. In Hubli in Karnataka, his schedule was the same — a 10-minute official event to lay some foundation stones, followed by a 45-minute rally. On his 9 February trip to Assam, Tripura and Arunachal Pradesh, the PM’s schedule included around 15 minutes of official programmes in each state — laying the foundation stone of a greenfield airport at Hollongi, Arunachal, the All India Institute of Medical Sciences in Amingaon, Assam, and dedicating a 23.32 km railway track in southern Tripura — followed by rallies. His 3 February trip to Jammu and Kashmir had him lay the foundation stone for two AIIMS institutes in Jammu and Srinagar and the University of Ladakh, while also holding a rally in Jammu. On 9 January, he visited Solapur in Maharashtra and Agra in Uttar Pradesh, following the same pattern. These were his first rallies after Parliament passed the 10 per cent bill to provide quota to the ‘poor’ in the general category, and the PM was sure to mention that and add how “opposition was spreading lies”. In another instance, he visited Punjab on 3 January to inaugurate the 106th edition of Indian Science Congress and then held a rally at Gurdaspur. On 25 December, as he inaugurated Bogibeel bridge over Brahmaputra river in Assam, PM Modi addressed a rally in Dhemaji. “Four years ago nobody would have imagined that a man who was involved in a helicopter scam would be brought to India. Our government managed to do it,” he said, referring to Christian Michel’s extradition. A few political rallies — like the one in Dharamshala in Himachal Pradesh on 27 December to mark one year of the BJP government there and in Raigarh in Chhattisgarh on 8 February — were held without any big official purpose. The latter, however, was on his way to West Bengal where Modi addressed a big rally. Meanwhile, some trips like the ones to attend the Vibrant Gujarat summit or to inaugurate the cinema museum in Mumbai in mid-January did not have any accompanying public rally. Or for instance, when he visited Manipur on 4 January to lay the foundation stones for around eight new projects. In each of these cases, however, a rally was squeezed in elsewhere. Like between the Gujarat and Mumbai visit, the PM went to Silvassa to mark the setting up of the Hazira gun factory and addressed a public meeting. Meanwhile, in the latter case, the PM went from Imphal to Silchar in Assam and held a rally, where he talked extensively about the controversial Citizenship (Amendment) Bill. Sources in the BJP say the only ‘extra’ cost and logistical aspect of holding political events even with PM’s official functions is the money spent on rallies and the organising that goes into them. The BJP claims it is the party that takes care of both these aspects during each rally. As for PM’s travel, even campaign/political trips are taken care of by the state, given security rules. An email with detailed queries was sent to the Information Officer at the Prime Minister’s office but no response was received at the time of publishing. The story will be updated when the PMO responds. Mr Modi mixes political trips with official work, and NOT official trips with politics. Only a computer can simultaneously work in foreground and background, which is called multitasking. Can ANY human being who has one awake mind do two tasks? When Mr Modi might have heard the word “multitasking” for the first time, his immediate retort must have been, “yes! I can do multitasking” — our PM is so full of himself! Planning political chess; knowing micro-issues of each place, preparing speeches accordingly; meeting local party workers etc. This is FULL TIME work. Worms will start coming out of the can only after 2019 results. There will be detailed statistics about what percentage of time he was abroad, how much time working as a BJP worker, and how much time as PS — pradhan sevak. Every bit of administrative work is in a mess. Entire country is in a mess. Only one of the two things will happen post-elections: either India’s economy will be officially declared to have collapsed, or 2008-like USA-like financial stimulus will be introduced. Both due entirely to Mr Modi.